Unemployment hit a 25-year high this week. WASHINGTON — Companies are still not hiring, but the pace of layoffs in May dropped enough to give Wall Street something to cheer. Employers cut 345,000 jobs for the month, the fewest since September. That was enough to push the unemployment rate to a 25-year high of 9.4% -- up half a percent from April -- but the smaller-than-expected reduction in payroll jobs added to evidence that the recession is loosening its hold on the country. It marked the fourth straight month that the pace of layoffs slowed. "This tide is turning," said Richard Yamarone, economist at Argus. "We expect this trend of slower job loss to continue throughout the year." Still, the increase in the nation's unemployment rate from 8.9 percent in April underscores the difficulties that America's 14.5 million unemployed are having in finding new jobs. Economists had expected the rate to hit 9.2 percent last month. If laid-off workers who have given up looking for new jobs or have settled for part-time work are included, the unemployment rate would have been 16.4 percent in May, the highest on records dating to 1994. Even with layoffs slowing, companies will be reluctant to hire until they feel certain that economic conditions are improving and that any recovery will last. Since the recession began in December 2007, the economy has lost a net total of 6 million jobs. As the recession — which is now the longest since World War II — bites into sales and profits, companies have turned to layoffs and other cost-cutting measures to survive the fallout. Those include holding down workers' hours and freezing or cutting pay. The average work week in May fell to 33.1 hours, the lowest on records dating to 1964. Job losses — while slower in May — were still widespread. Construction companies cut 59,000 jobs, down from 108,000 in April. Factories cut 156,000, on top of 154,000 in the previous month. Retailers cut 17,500 positions, compared with 36,500 in April. Financial activities cut 30,000, down from 45,000 in April. Even the government reduced employment — by 7,000 — after bulking up by 92,000 in April as it added workers for the 2010 Census. Education, health care, leisure and hospitality were among the industries adding jobs in May. Still, in another encouraging note, job losses in both March and April were less than previously thought. Employers cut 652,000 positions in March, versus 699,000 previously reported. They eliminated 504,000 jobs in April, less than the 539,000 initially estimated. The deepest job cuts of the recession came in January when 741,000 jobs disappeared, the most since 1949. Federal Reserve Chairman Ben Bernanke repeated his prediction this week that the recession will end this year, but again warned that any recovery will be gradual. Many economists believe the jobless rate will hit 10 percent by the end of this year. Some think it could rise as high as 10.7 percent by the second quarter of next year before it starts to make a slow descent. The post-World War II high was 10.8 percent at the end of 1982. Friday's report "supports the notion that the recession will end this year," Yamarone said. But pain will linger and the jobless rate will move higher. He predicts it will peak at 10.2 percent early next year. The Fed says unemployment will remain elevated into 2011 given the expectation of tepid recovery. 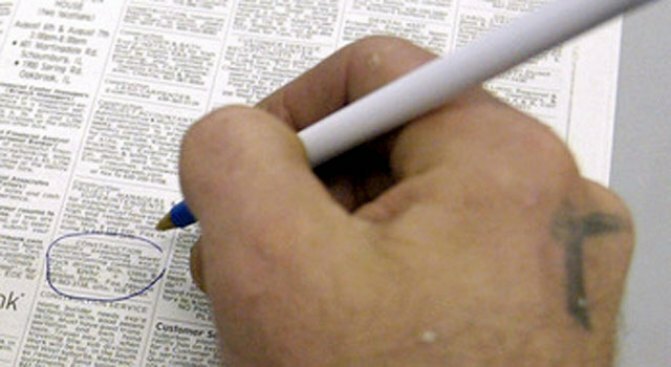 Economists say the job market may not get back to normal — meaning a 5 percent unemployment rate — until 2013. Economic recoveries after financial crises tend to be slower, economists say. Evidence has been mounting that the recession is letting up, with fresh signs emerging earlier this week. The number of people continuing to draw unemployment benefits dipped for the first time in 20 weeks, and first-time claims also fell. Manufacturing's slide is slowing. Builders are boosting spending on construction projects and a barometer of home sales firmed. Although shoppers remain cautious according to sales results from major retailers, Bernanke and other economists are hopeful that consumers won't return to the deep hibernation seen at the end of last year. That's when the recession hit with brutal force, causing the economy to contract at a 6.3 percent pace, the most in 25 years. Consumers cut their spending at the time by the most in nearly three decades. Economic activity shrank at a 5.7 percent pace in the first three months of this year, despite a rebound by consumers. Many analysts believe the economy is shrinking at about a 2 percent pace in the current quarter, and that the economy could return to growth as soon as the third quarter. President Barack Obama's stimulus package should help bolster the economy. Ripple-effects from General Motors Corp.'s filing for bankruptcy protection — the fourth largest in U.S. history — could muddy the outlook, some analysts said. GM said earlier this week it will close nine factories and idle three others indefinitely as part of its restructuring. The closings, which will take place through the end of 2010, will cost up to 20,000 workers their jobs.